If you are not a rock climber, you may not heard of top rope and may wonder what is top rope climbing? It is a type of climbing that passes a rope through an anchor system at the top of the climb, a climber is securely attached to the rope, and a belayer at the foot of the climb belaying the climber to the top. In general, top rope climbing is safer and psychologically and physically less demanding than lead climbing or bouldering. 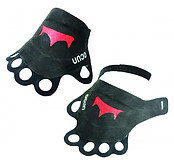 You can top rope climbing outdoor or indoor. 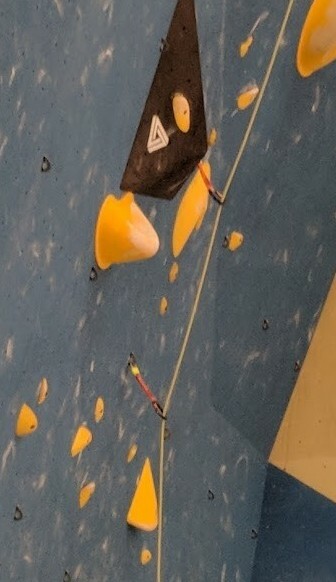 I was introduced to top roping in an indoor rock climbing gym. If you are a first time climber and do not have friends who can be your guides to climbing outdoor, I would recommend to try out rock climbing in an indoor climbing facility first. Learning top roping in an indoor facility is the simplest and cheapest route for a beginning climber like me when I started. A rock gym has all the equipment and artificial rocks for us to climb safely. We provide our own personal equipment such as climbing shoes, harness, belay device with a carabiner, and possibly our own rope for lead climbing. The gym provides rope for top roping. For top roping indoor, the anchor is usually a tubular pipe located at the top of the climb. Different gyms have different preference on how the rope are looped around a pipe. The rope can be looped twice around the pipe or once around pipe. I have been to climbing gyms that uses chains to loop once around the pipe. 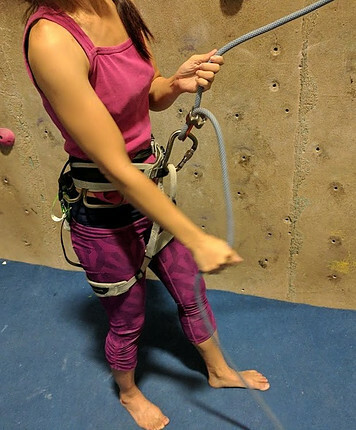 Each one of these techniques effect differently with the belaying. For a single loop top roping, the belayer should be on extra alert. If the climber is heavier than the belayer and when the climber falls, the belayer will be pulled up off the ground while catching the climber’s fall. To resolve this issue, the gym usually provide an extra 50 pound weighted sandbag to anchor the belayer to the ground. The rope wears out slower than a double loop. It is easier to lower kids with light weight down to the ground. For a double loop top roping, there is more friction to the rope so when a climber falls the belayer is not pulled up off the ground. Personally, I prefer the double loop top roping method. I am usually the lighter belayer and my climber is my husband so the double loop helps keep my feet on the ground when I belay. It is also much more forgiving for a new belayer. The gym we climb at has the double loop method. On the negative side, the rope wears out quicker than the single loop and it is harder to lower little kids lighter than 30 pounds. For lighter climber, it feels like the belayer needs to push the rope through the belay device in order to lower the climber. Some gyms use a short chain loop around the pipe once. The rope is then looped through the ends of the chain. The chain creates more friction than a single loop but still less friction than the double loop. I still need the extra 50 pound sandbag to weigh me down while belaying a heavier climber. I do not know much about the wear and tear of the rope using this method. Top roping outdoor is also a lot of fun. However, it is helpful that you are top roping with a class, a guide, or with a friend who is an experienced outdoor climber. There are a lot more setup and equipment involved. You will also have to deal with nature and the weather such as rain. Top roping anchor for outdoor can be a tree, a solid rock, or a crack using a cam for trad climbing (this is another climbing technique). In general for outdoor, top roping is often recommended for certain area because it cannot be lead climbed for various reasons such as unsafe or environmentally damaging. For an example, we visited Great Falls in Virginia located in the DC and surrounding areas. This area is common used for top roping. There are also lots of cracks so there are trad climbing available which can be lead climbed. Lead climbing safely at Great Falls is a debatable topic among the climbing community. In my opinion, if there are any doubts, I would top rope instead of lead. I love doing both top roping indoor and outdoor. Each location has its advantages and disadvantages. When perfect condition exists for outdoor climbing such as good weather, good climbing location, excellent equipment, and a fantastic partner, I would choose climbing outdoor. I love to feel the texture of the rocks and the freedom to choose where my next hold would be. Even though the artificial rocks are built to mimic the real rocks they still are not the same. We are in the open with fresh air and the slight breeze blowing against my hair as I ascend to the top. The slight breeze does not happen all the time especially during hot and humid weather. However, I love being outdoor. Every time I come back from a climbing road trip, I build more confidence. On the other hand, I can climb indoor any time. I live pretty close to a climbing gym so I can climb as often as I like on my own schedule regardless of the weather. I do not have the same luxury climbing outdoor. When we climb outdoor, we would need at least a 3 day weekend road trip to make it worth while. Our climbing road trip does not happen as often as I would like. 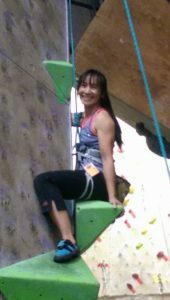 In conclusion, I practice in building strength and technique with my regular climbs at the gym and plan climbing road trips twice or three times a year to apply the technique that I have been practicing. I can have the best of both worlds. I hope this article help with your understand regarding rock climbing a little bit more. Please feel free to drop me a note on your thoughts below. Thanks for this post! I used to be an avid rock climber back in high school. Its a great workout and mental challenge. I never was any good at it, but I never let that stop me! I have always wanted to try outdoor rock climbing but I unfortunately never had the time, (or courage) to follow this through with proper road trip planning. Your outline of the pros and cons of outdoor climbing has helped me see that it is really something I want to do, and I should be better about making it happen.